With many years in the conveying industry, CSL fully understand the consequences of breakdowns particularly outside the initial Warranty period! Due to the reliability of our conveyor systems, and lack of running issues, it is easy to see why regular maintenance or an on-site spares holding appears to be deemed not necessary. This can be a false economy as invariably an unplanned stoppage can be very costly in terms of both reduced output volumes and subsequent call out costs. 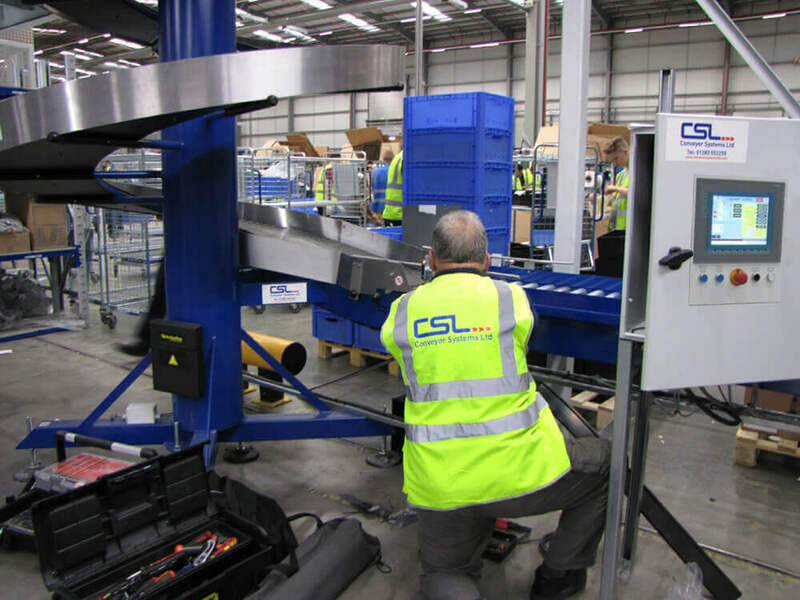 In an effort to keep unexpected downtime and subsequent disruption to a minimum, CSL can offer a wide range of support services to suit most budgets and can tailor a package to include spare parts, Breakdown Support Service and Maintenance Contracts. SPARE PARTS - This could include anything from adhoc ordering of individual parts, “front line” breakdown spares kits, critical wear parts or comprehensive spares packages to suit your bespoke system to be fitted by either your in-house maintenance engineers or fully experienced CSL engineers. Spare parts packages can be mechanical, electrical or control based or even a mix to suit your system and requirements. Prepare a written Engineers Report as to both the work done and any recommendations for further remedial action. More customers are monitoring their systems performance for management purposes – reporting and logging downtime, planning maintenance, product traceability, etc. This can now be easily achieved with the advancements in web based technologies and other remote communications thus giving CSL the ability to log into your control system from our offices or anywhere we have a phone signal in order to assist you in fault finding, etc. In the event of a more serious issue which cannot be sorted over the ‘phone, a priority visit to site by a relevant mechanical/electrical/software engineer within the minimum time possible would be actioned in an effort to get you back up and running as soon as possible.